Lisburn riders Neil Campbell and Ross Graham on their way to three first place finishes. Lisburn Crew Neil Campbell & Ross Graham took the overall in round three of the NI Sidecarcross Supporters Club Ulster Sidecarcross Championship at Seaforde last weekend. That’s after title rival Wayne Garrett crashed heavily in the previous round, sustaining a broken leg amongst other injuries and puttimg himself out for the season. 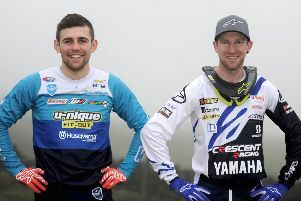 Bird and Hamilton will battle it out in Round Five in Downpatrick this Saturday with Dromara rider Ryan Adair also hoping to make an impact, if he has recovered from his nasty crash at the recent Brian Bell meeting. Racing starts around 11am and entry is £5 with U14s going free. The circuit is signposted off the old main Clough Road.